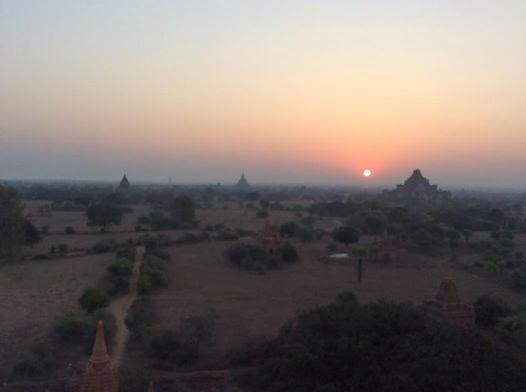 Watching sunrise in Bagan is a "magical" experience that you shoulnt miss when traveling to Myanmar. We waited for the spectacular view in curiosity and finally was compensated for our patience. It’s when thousands of 12th century pagodas are basked in a warm orange light, providing a perfect photo opportunity for snap happy visitors. We climbed up the steep steps carved into the side of the pagoda, using our hands to guide us in the dark, and we discovered about 15 other tourists already at the top, and more to come, many armed with tripods and telephoto lenses. We waited under a thick blanket of stars for the sun to slowly drive out the night and bring the ancient temples into existence. The early morning dimness starts to fade as I make out figures of temples ahead of us. 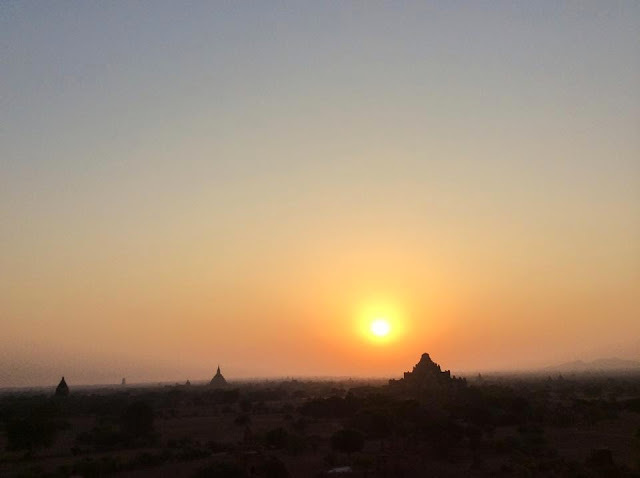 As the brimming orange sun breached the horizon, the pyramid-shaped Dhammayangyi temple the most prominent amidst the plain of pagodas, more than a dozen hot air balloons floated into the sky, as if someone had opened their hand releasing the balloons toward the sun. The magic began when the sun started rising on the horizon. When long shadows extend on the temples giving them shape and highlight. The light intensified rendering a golden hue to the whole landscape. Meanwhile balloons on the horizon started venturing for the sky. Playfully moving around like a bee, checking out the temples. This was the scene I had imagined I would be seeing and it was right there before my eyes. It was nothing short of magnificent.